In tribute to the total solar eclipse that was visible across the United States on Monday, we’re excited to present a poem written nearly 2500 years ago on April 6, 648 BC by Archilochus, a Greek lyric poet from the island of Paros who was well-known for composing poems based on his emotions and experiences. 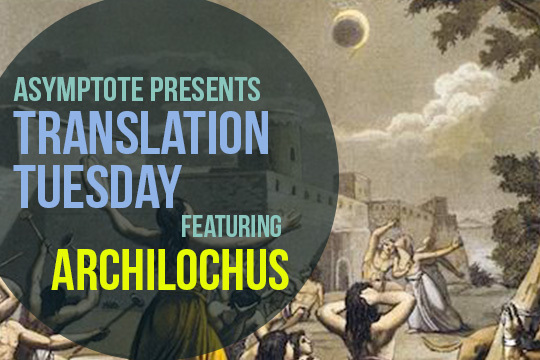 What remains of the poem Archilochus composed is a fragment that recounts a solar eclipse, where, needless to say, things get very weird very quickly. Translated by Aaron Poochigan. to make it night at noontime, even though the sun was shining. and dolphins with their flippers come to love a mountain glen. Aaron Poochigan is the author of the thriller in verse Mr. Either/Or (www.mreitheror.com) and the poetry collection Manhattanite (www.aaronpoochigian.com).